If your Halloween travels include a stop in Yosemite National Park, then don’t miss the spooktacular ranger program at Yosemite Cemetery on October 30 and 31, 2016. The hour-long walking tour includes historical – and sometimes creepy – stories about some of the people buried in the cemetery, which dates back to the 1870s. After the tour, more stories will be shared by the campfire at the Yosemite Valley Indian Cultural Museum. 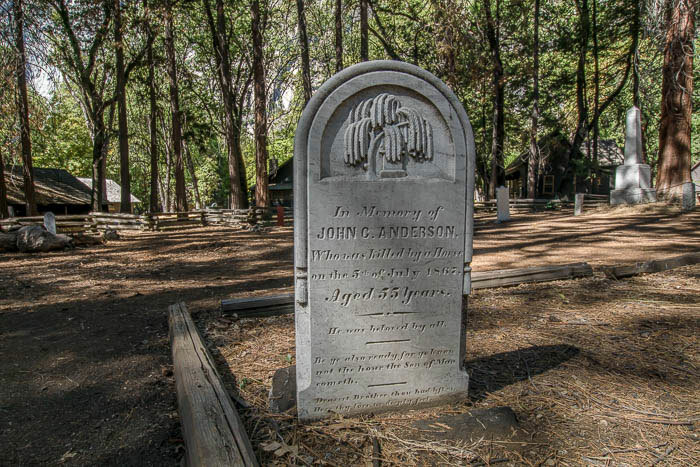 The Yosemite Cemetery is located across the street from the Yosemite Valley Indian Cultural Museum. Accessible street parking is located nearby. Alternatively, the lift-equipped park shuttle stops at the Yosemite Valley Visitor Center, which is just a short level walk from the museum. The hard-packed dirt paths through the cemetery are level, and although there are a few bumps near the entrance, they are navigable for most wheelchair-users and slow walkers. There are also benches to sit and rest along the way. Two programs are held each night – one begins at 8:00, and the other begins at 9:00. Both sessions are appropriate for children, and they begin at the campfire at the Yosemite Valley Indian Cultural Museum. Participants are reminded to dress warm and bring a flashlight. For more information, call (209) 372-1153.